I love my mother. I really do. Over the past six months, after dealing with a scary cancer diagnosis, and getting through her surgery with flying colors, I appreciate my mother even more. After my father passed away 20 years ago, my mother has been both a mom and a dad to my sister and me. Seema has been awesome in partnering up with me to take care of my mom as well, I must say. So, this post is just a reminder that the best gift that you can give to your mother is your time. I’m trying to do that every day and I encourage all of you (who have mothers that are still alive) to please do the same. I’ve been told by people much wiser than I am that the time I spend now with my mom will be rewarded in the future by my kids. It’s a cyclical pattern – what goes around does in fact come around. And, by the way, if you need a gift for mom, we have an awesome, limited selection at Seema’s Boutique inside Island Ship Center. Thank you for your trust and kindness. May every day be Mother’s Day for you. 10 years ago, I had a vision: To provide our community with a spa of shipping (#SpaOfShipping), to make it a fun place, where people can come to feel good about themselves, and still get mundane tasks accomplished, like shipping, faxing, copying, etc. As I look back, thanks to all the wonderful people I have met, this journey has been worth it! 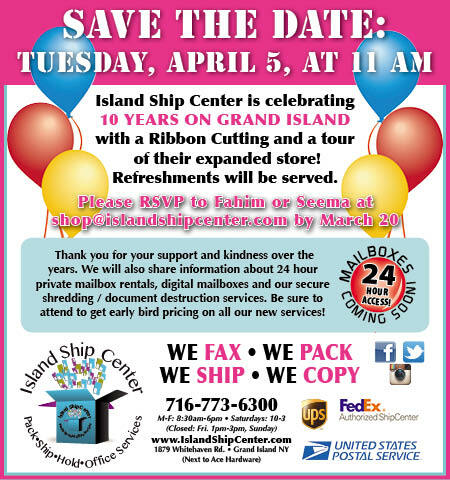 As we complete our remodeling job in the front of the store, I now invite you to join me in celebrating 10 years on Grand Island, on Tuesday, April 5th at 11 AM. I’m sure my late father would have been proud of me. I’m anxious to show you 6 new services that we are launching that day, including digital mailboxes, private mailboxes, international shipping options, furniture shipping (with a new loading dock, custom built in the back of our building), unique gift items displayed elegantly in our expanded store space, and secure shredding with document destruction, to help control the epidemic of identity theft. All of these services are nothing without your trust and support; so please, join Seema & me for some unique refreshments on April 5th (we plan to have some nice Indian snacks for your palatable pleasure). Please RSVP by March 20th so we can put your on our guest list.